1. As already noted via many, in that Media Pro is soon going to be unusable, I'm trying to figure out how to migrate my Media Pro catalog (thousands of images) to another application. 2. Question: there aren't that many alternatives but among those possibilities, the first step is to export the Media Pro catalog into a XML format (something like that). Huge problem: at this very first step, I get this message saying that I need the original source images. Of course I have the original source images, but they're spread across terabytes of data (external hard drives) and the original path to media pro have probably been long broken in that I update my external hard drives every so many years. Thus, pragmatically and realistically, is there a method to export media pro (without being a software engineer)? I think it partly depends what you want to export it to. You can for instance import a Media Pro catalog directly into a Capture One catalog - you may or may not want to of course. Thanks for the thought, but the only way to export a media pro catalog into capture one is if you have access and I also assume the original path to the original source images; I have 35,000 images in my media pro catalog and refresh my external hard drives on a routine basis; thus, pragmatically, there is NOT a method to migrate media pro data into capture one. Anyone else with a solution??? So are you saying that your MP catalog includes items to which the catalog doesn't have an up to date link? In regards to the last question, yes, I have a media pro catalog that probably no longer has the correct path back to the original image for the reasons mentioned in the original post. I did contact Phase One and the recommended a procedure by which I "reset image path" (or something like that)... which didn't work. Surely for any catalog app you use instead of Media Pro, you are going to need access to the original images? In my experience the Reset Folder Path... feature works. Obviously the media on which the images are now located need to be connected to the computer. If a folder has the ? 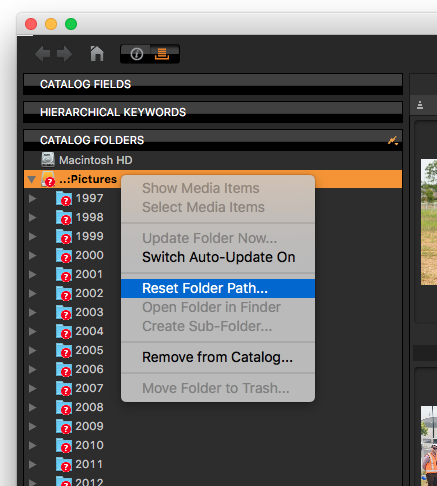 symbol on it in the Media Pro Catalog Folders section, I can just right click on it, choose Reset Folder Path, and navigate to the new location of that folder. Best practice is to do all your media management (renaming, moving, etc,) in the catalog application so it knows where the images are. That said, Media Pro on Mac is the only application I know that can see if you move files in the Finder and reset them automatically. Just don't do it!